This topic covers breast changes that feel lumpy, thick, and tender before your menstrual period. It is not meant for women who have had a breast biopsy showing "atypia" or "hyperplasia." These are cell changes that may lead to cancer. Many women have breasts that feel lumpy, thick, and tender, especially right before their periods. These symptoms are called fibrocystic breast changes. They may also be called cyclic breast changes because they come and go with your menstrual cycle. Fibrocystic breast changes are normal and harmless. They are not cancer, and they do not increase your chance of getting breast cancer. But having fibrocystic breast changes can make it harder to find a lump that could be cancer. This is a special concern if you also have a higher than normal risk for breast cancer. So if you or a close family member has had breast cancer, or you have had radiation treatment or a breast biopsy showing atypical ductal hyperplasia (ADH), talk to your doctor about how often you need a breast checkup. Doing a breast self-exam each month may help you know if an abnormal change occurs. Experts think that fibrocystic breast changes are linked to the hormone changes that happen during your menstrual cycle. Each month, your body gets ready for a possible pregnancy. It releases hormones that signal the breasts to make milk. 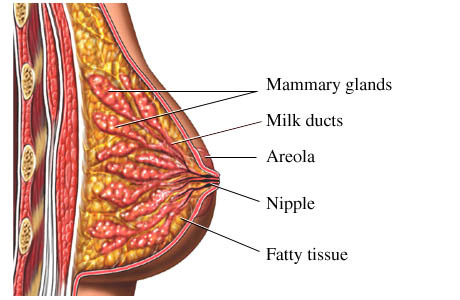 The milk (or mammary) glands get bigger, which may make your breasts feel lumpy and tender. These symptoms go away after you start your period. You are more likely to have fibrocystic breasts if your mother or sisters have them too. If you notice a new breast lump, wait through one menstrual cycle. If it is still there after your period, see your doctor for a breast exam. If you are not having menstrual periods, see your doctor for a breast exam as soon as you notice a new lump. To diagnose fibrocystic breast changes, your doctor will do a breast exam and ask when you had your last period. If your doctor needs more information, you may have a mammogram, ultrasound, or needle biopsy. Your doctor can teach you how to check your breasts at home. When you know what’s normal for you, you’re better able to notice changes and know when to get help early instead of waiting for your next checkup. A self-exam is not a substitute for a mammogram or a clinical breast exam. Take an over-the-counter pain medicine like acetaminophen (such as Tylenol) or ibuprofen (such as Advil). If this does not help, ask your doctor about using a nonsteroidal anti-inflammatory drug (NSAID) skin cream. You can try taking magnesium for the 2 weeks before your period. Taking 400 mg a day may reduce breast pain and other symptoms. Some women may feel better when they give up caffeine, eat a very low-fat diet, or take the herb vitex. Before trying these remedies, talk to your doctor about what is right for you. Ask your doctor about low-dose birth control pills. For some women, they help reduce breast soreness and swelling before periods. They may be a good choice if your symptoms bother you and you want to prevent pregnancy. There are stronger medicines your doctor can prescribe for breast pain, but they also have more side effects.